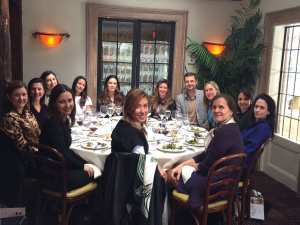 On Tuesday, March 10th, interior designer Marcia Tucker organized a luncheon at Hotel Homestead Inn – Thomas Henkelmann, in Greenwich, Connecticut in support of BrazilFoundation. The event brought together Brazilian women from the greater Greenwich community to spur dialogue and collaboration behind ideas and actions that transform Brazil. After 14 years of fundraising and building a strong network of collaborators in New York City, BrazilFoundation is thrilled to reach out to another city that has such a strong Brazilian community. “I am so proud to be able to support BrazilFoundation through events such as our women’s luncheon. Our wonderful meeting was a great chance to partake in philanthropic work…” commented Marcia. BrazilFoundation would like to give a special thanks to Marcia Tucker for graciously hosting the event, and looks forward to building a strong community of supporters in Greenwich for a better Brazil! If you would like to become active in the BrazilFoundation community in Greenwich, contact us: newyork@brazilfoundation.org.